To celebrate the arrival of our latest and greatest product, Preppy In Paradise is giving away a set of the Piggy Paint nail polish! 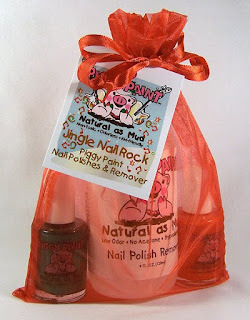 "Jingle Nail Rock" includes a sparkling deep green polish and a bright red polish as well as a bottle of remover. We have been making liberal use of the Piggy Paint since it arrived and the colors are just amazing. Its really fun and any girl, of any age will definitely get into the holiday spirit with this set! to check out the colors! Contest ends November 30th so tell your friends. Oh, and if you don't give us your email address, we wont know how to contact you - all you crazy bloggers! Stay tuned later today when Alexandra draws the winner of the Preppy Tee contest! I love the names of them all...my favorites would have to be Angel Kisses then Glass Slipper and Dragon Tears!